Last month I won a Grateful Giveaway by entering with Nicole’s Nickels Blog and it came in the mail today! I squealed with delight and then quickly took it to show my husband at work. Then off to a girlfirend’s house to peruse and try them! Can”t wait to try others. We also tried the the organic coconut & sugar lip polish which totally did the trick. Check out all their AWESOME products … I had no idea they had so many varieties! Anyways, so excited about my prize package, and just had to share. I’m using PURE softlips 100% natural lip gloss with sunscreen (SPF 15) in Coral Charm and I LOVE IT! Always looking for a deal, and usually finding one. Hmmmm . . . where did you get that instinct? Oh my, I didn't realize there was such a variety of Soft Lips products either! Nice! 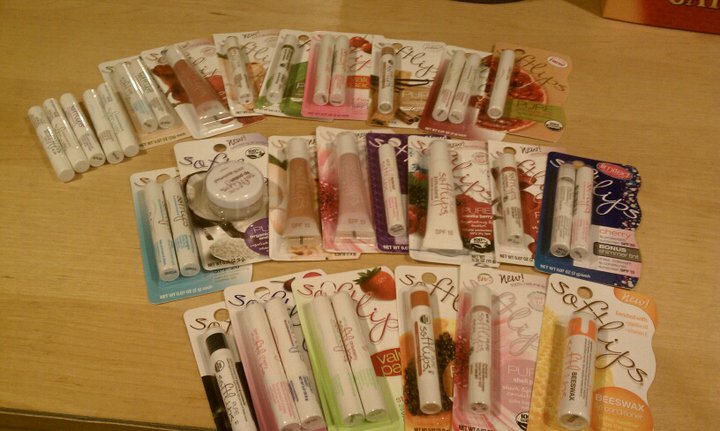 I totally didn't know there were so many soft lips products! I'm sure it'll be fun to try them all out!